One last look at the Italian LOVE design at print.flagnation.com. Now you should have a good idea of what products are available at what PODs. First we look at the section of Italian LOVE designs that only appear on the front of the product. To this end, we have a lovely almond colored cap (coloured, if you speak British). You can buy the item by clicking on the picture below, or here. Second, are charmed by the cute, black, toddler tee with the design on the back only. 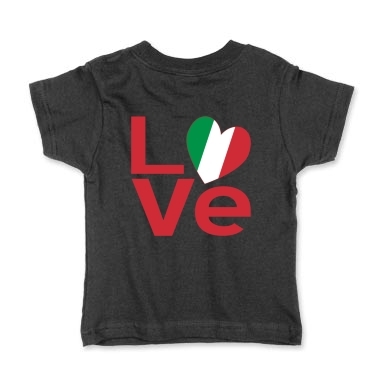 How wonderful your little bambino will look in this fashionable t-shirt with the Italy in Love or Italian Love design. You can purchase it by clicking on the picture below or here. Last, and of course, not least, we show a beautiful black and red women’s fitted baseball jersey. 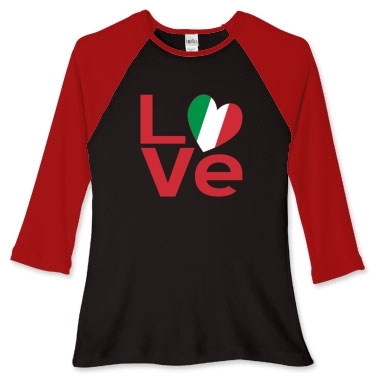 It makes the Italy in Love design show gorgeously and will make you or your lady look terrific. You can purchase it by clicking on the picture below or here. With this we end our tour of the Italy in LOVE or Italian LOVE design. Remember, just a little more than 30 shopping days left till Valentine’s Day. Please be sure to allow ample time for shipping of your gift, too. Shop early to avoid dissapointment or higher shipping fees. Today we are going to visit the Italian love designs at ink.flagnation.com. Yes, I know you spent a lot of time looking at these designs. But I like them. And I just would like you to see what is available at all the different print on demand sites that carry my designs. Inktastic offers a wide range of items for children. They have the largest amount of stuffed animals of any POD I have seen, including many cute and cuddly Gund bears. They also have the largest selection of items for babies, infants, toddlers and children that I have seen in any POD on the Internet. For example, they are the only ones I know of that carry these cute little toddler dresses with all the nice little ruffles that makes baby look so girly. Our first design shows a red lettuce leaf edge baby dress with the Italian love design. Perfect for your family’s new baby, grandma’s delight, the pride of grandpa’s eye, and in uncle’s favorite niece, and/or mom and dad’s pride and joy. You can purchase it by clicking on the picture or by clicking here. Our second design, features the wonderful Gund bear, perfect for your girlfriend, significant other, niece, nephew, boyfriend, mom, dad or anybody that likes snuggly cute stuff. Of course, this one wears the charming Italian love design. You can purchase it by clicking on the picture or by clicking here. Next on our list is a child’s polo shirt. I do believe that inktastic is the only POD that carries polo shirts for children, but I might be wrong. That said is still very smart looking for your favorite bambino to be wearing the lovely Italian love design on their polo shirt. To purchase click on the picture, or buy it by clicking here. Last but certainly not least, we have a child’s apron with the Italian love design at ink.Flagnation.com. This fun design will surely make your child smile as they learn to help you in the kitchen and around the house. You can also buy an identical one for mother-daughter/father-son looks. Buy one for everyone in the family! By click on the picture or here. That’s all for today’s tour. You can see all the products with all this design by visiting here. Remember, there are just a little more than 30 shopping days till Valentine’s Day. Happy shopping! Design shows both flags of Italy and USA. Reads, “Italian by birth American by choice”. Share your pride and love in both your new and old heritages, cultures and ancestries. Great gift for anyone you know who is an Italian immigrant to America. Wonderful for new citizens or to honor parents, grandparents or anyone you know of Italian heritage who is now a USA citizen. Terrific design features the love and pride you have in your Italian heritage, culture and ancestry. Travelers will like recalling a trip, vacation or holiday to Italy. 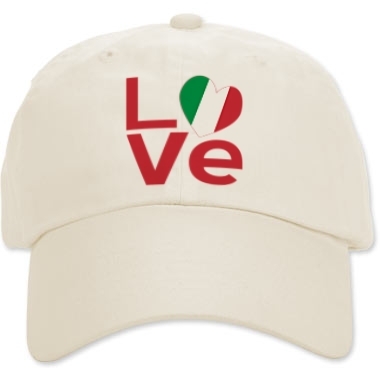 Features the word “LOVE” with a heart-shaped Italian Flag for the “O”. Viva Italia! Flag of Italy, reads, “If God had meant for me to be skinny, He wouldn’t have invented Italian pasta.” Funny design with humor for those who like to laugh. Fun for Italian food lovers and travelers who ate their way through their trip, vacation or holiday!